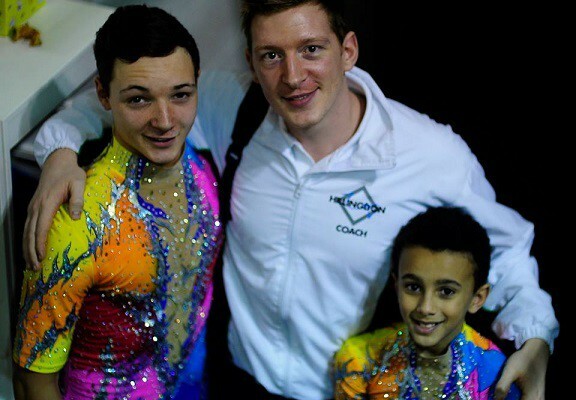 Two young gymnasts Callum Portugal-Walker (17) and Keiran Blower (12) from London Borough of Hillingdon Gymnastics Club, based at Better’s Botwell Green Sports & Leisure Centre in Hayes, have been selected to represent their club and country in the upcoming 2016 Acrobatic Gymnastic World Champions hips. The Men’s pair are trained for 19 hours a week by Alex Uttley, former multiple British and World Champion and ‘Britain’s Got Talent’ winner as frontman of ‘Spellbound’ along with head coach Karen de Sa. The young pair have endured a gruelling selection process having to perform at two World trial selection events, while also being reviewed on previous competition results and reputation. They are both still in full time education. Nonetheless, the boys showed excellent technique, strength, style, determination and trust to secure 1st place in both selection events, giving them an automatic selection to go to the championships. The 2016 Acrobatic Gymnastic World Championship in China are a self funded event. Fortunately the pair receive financial support from the GLL Sport Foundation (GSF), the largest independent athlete support programme in the UK, operated by charitable social enterprise, GLL. The programme works in partnership with sport national governing bodies through the national charity SportsAid to support the next generation of sporting talent. Both athletes have re-applied into the GLL Sport Foundation this year and are waiting to hear back if they have been successful. Support from the foundation would mean that they continue to have access to free strength and conditioning at all Better Centres, physiotheraphy and sport science, with the potential of receiving financial funding to help with training equipment, travel and all the other necessities that athletes need. Hopefully the continued support from the GLL Sport Foundation can help Callum and Kieran get to the next level in gymnastics. We are now proud of announce that Callum and Kieran won Gold at the World Championships! An excellent achievement that has received a lot of media attention – watch this space!